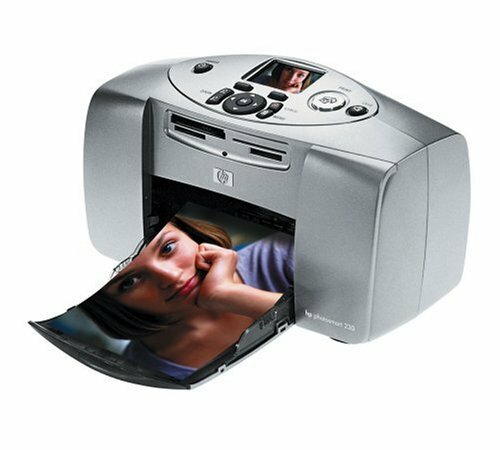 Have an easy and fun time printing photos with the HP Photosmart 230. This compact and basic printer is designed for photo enthusiasts and delivers high-quality prints. It has an LCD display and an easy-to-use control panel plus memory card slots for easy photo printing. Because it is small, though, it can only produce wallet-size and 4x6 photos. Don't worry about a printer taking up all the space of your desk. The HP Photosmart 230 is a small gadget but packs a mean punch with its crisp pictures and convenient features. An LCD display along with a control panel is on top; the paper tray is foldable, so the HP Photosmart 230 takes up even less space when not in use. The HP Photosmart 230 is dedicated to photo printing so expect excellent and high-quality photos. This printer is also portable, being extremely lightweight. There is no need to connect the HP Photosmart 230 to a computer, as it features an LCD that lets users edit and preview pictures. It also boasts memory card slots. Of course, this printer cannot be used for printing text and graphics. It can only print small photos, and may not be suitable for professional photography requirements. Total media capacity and the duty cycle are also low. Still, the Photosmart 230 by Hewlett Packard is one of the best dedicated photo printers around.